Wrecking Crew as it appears in Smash. Wrecking Crew (レッキングクルー, Wrecking Crew) is a stage in Super Smash Bros. for Wii U and Super Smash Bros. Ultimate based on the NES title of the same name. Despite originating from the Mario universe, this stage is classified as belonging to its own Wrecking Crew universe. Unlike many stages based off retro games, its design has been given a 3D overhaul like Icicle Mountain and Skyworld, rather than trying to imitate NES graphics. In Smash 4 and Ultimate, R.O.B. is battled here for its unlocking battle. Wrecking Crew is very large vertically, giving characters who can survive vertical hits a large advantage. However, climbable ladders are strewn throughout Wrecking Crew, which allow easy vertical scaling of the stage. The stage has a main platform that is solid and continues to the lower blast line, with up to 4 rows of drop-through platforms above it, which are connected by the ladders, and stone buildings in the background. Barrels appear on various areas throughout the stage, which act like walls. Occasionally, bombs the size of most characters will spawn on small green pedestals set throughout the stage; these can explode if attacked. When a bomb explodes, nearby stone buildings will collapse and nearby barrels will be destroyed. Bombs can even cause other bombs to explode, causing a chain reaction. If a row of platforms does not have enough buildings or ladders to support it, the row will fall down (a row needs at least 3 buildings); new ones will fall in from the top of the screen. 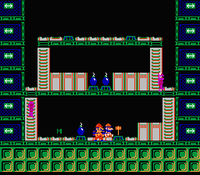 As in the original Wrecking Crew, players can get trapped under barrels that come down with the row, preventing them from moving for a while and giving other players an attacking advantage. When broken out of a barrel, the opponent will receive double the normal damage from the attack that broke them out. Oddly, the normal amount of damage will be shown on the damage and combo counter in training mode, despite it usually adjusting for damage multipliers. In Ultimate, platforms will turn orange if a ladder is connected to them. 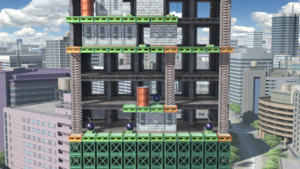 In Super Smash Bros. for Wii U, the Ω form is set on a balcony with ledges that extend below the blast line. No floors, walls, or other hazards are present. Players can get Star KO'd here in Smash 4. In Super Smash Bros. Ultimate, the Ω form and Battlefield form are set on a similar platform as SSB4's Ω form; however, the platform no longer extends below the blast line and is resized and reshaped to match Final Destination and Battlefield, respectively. The three soft platforms of the Battlefield form resemble the orange girders of the normal form. Wrecking Crew is a NES game starring Mario (with Luigi as the second player). The objective of the game is to use Mario's hammer to destroy all the stone walls in the background of each level while avoiding enemies. Some of these walls have ladders on them for Mario to use. Bombs can be struck to cause a chain reaction and destroy many walls at once; hitting bombs in the right order can cause a Golden Hammer to appear. Mario cannot jump in this game and cannot defeat enemies normally, but can trap them by causing barrels to fall on them. This stage is banned from tournaments for numerous reasons. The layout of the stage allows for camping and stalling, and the layout can also change constantly due to the bombs. The bombs also act as stage hazards, as they deal damage when they explode. The ladders can cause players to grab on to them when they meant to jump or use an up aerial/special. Players can also get trapped in the barrels. Wrecking Crew in Super Smash Bros. for Wii U. One of the pedestals on which bombs can form. Mr. Game & Watch on a ladder. King Dedede attacking another fighter on the stage. Little Mac performing his side taunt on the stage. Mario taunting in his Builder outfit on the stage. Mega Man cooling down after performing Spark Shock on the stage. The Mii Gunner striking Luigi with its Gunner Missile on the stage. Ridley jumping on the stage. Ridley using a Hammer on the stage. Sonic idling on the stage. Ryu performing a Hadoken at Sukapon on the stage. Sukapon using Tondeker on the stage. Zero Suit Samus idling on the stage. Samus firing a Missile on the stage. Normally the number of floors in the stage is infinite, but in the event matches Wrecking Mario and Wrecking Bros. there is a limited number of floors to account for the event's goal of leveling the entire building. Characters trapped under barrels become vulnerable to all player attacks, even by teammates with Team Attack off. If Stage Morph occurs right when the character gets trapped under the barrel, the character will freeze with intangibility frames for the entire match. It is possible to go inside of the main platform through a glitch. This page was last edited on April 16, 2019, at 07:42.